Location: Torres Del Paine, Patagonia, Chile. Torres Del Paine National Park is considered as one of the world’s most beautiful natural areas, encompassing more than 240,000 hectares in the heart of the Chilean Patagonia region. 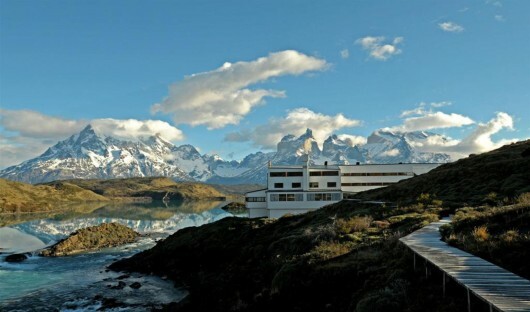 explora Patagonia, with its exclusive location and highly privileged views was designed as the perfect base for exploration of this unforgettable region. explora hotel Salto Chico offers all the comforts of a first class resort, achieving the perfect balance of elegance and style combined with comfort and quality. Featuring handmade furniture made with local materials by local artisans this impressive architectural feat is reflective of the area it is in. 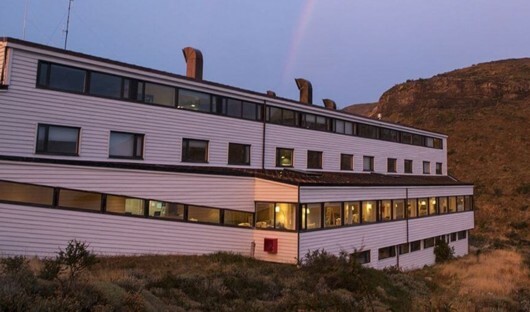 Hotel facilities include saunas, a swimming pool, a private pier, boats and mountain bikes. The hotel even boasts an outdoor jacuzzi. Imagine, in the middle of winter, sipping a delicious Chilean wine while relaxing in the jacuzzi, surrounded by snow and stunning views! 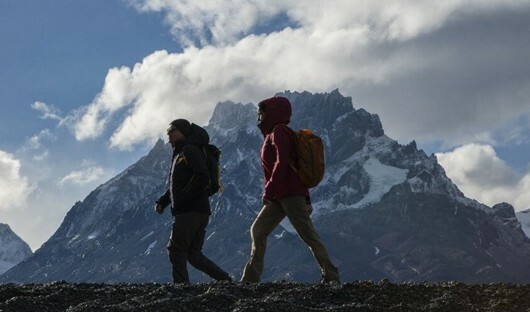 explora Patagonia offers excursions for all fitness levels and interests. The property offers 40 explorations in all areas of the park either on foot, horseback or by van. Experience beautiful views of crystal clear lakes, lenga tree forests, hikes to astounding viewpoints and horseback rides through the Park’s grasslands and along the flowing rivers. explora Patagonia’s guides are passionate and professional with a deep understanding of the region. They love what they do and sharing their home with travellers from all over the world. All the guides speak excellent English. 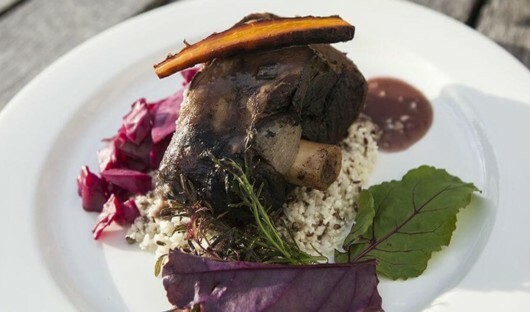 You will enjoy excellent local cuisine at explora Patagonia made from locally sourced produce and recipes. This minimises the need to import food reducing the impact on the environment. Dishes are produced with the ability for guests to perform various explorations and still feel light, agile and healthy. Dishes at explora are always accompanied by superb Chilean wine. 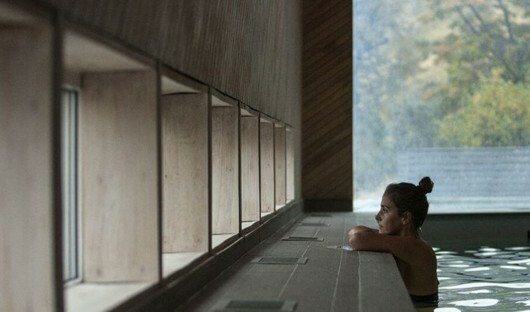 explora Patagonia features a massage room and pool area 100 metres away from the main building, easily reachable by a wooden path. Equipped with a heated, covered pool, sauna and four open-air jacuzzi’s with views to the Paine River. Offering a variety of massages and treatments, it is a fantastic place to relax after a day of excursions. 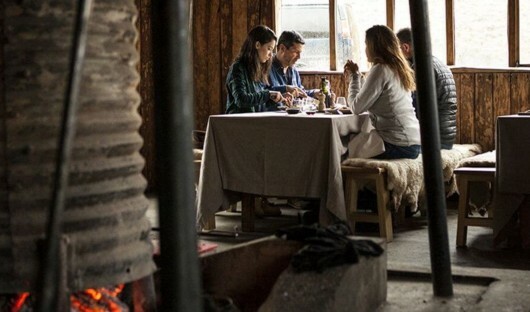 explora Patagonia’s construction is formed to allow it’s guests to inhabit the entire essence of such a remote location as Patagonia whilst still experiencing the essential luxuries without any distractions. Wood Plays a fundamental role in its design linking it with its beautiful natural surroundings. Located on the shores of Lake Pehoe, it has breathtaking views of the Paine ridge and the famed granite towers. 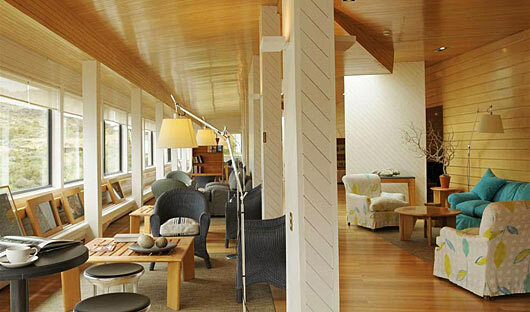 To ensure you have a relaxing, immersive holiday everything at explora Patagonia is included. Excursions, meals, beverages, transport and accommodation is taken care of so you can enjoy your break. 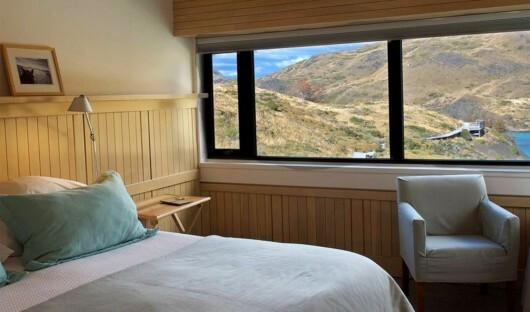 There are six Exploradores suites at explora Patagonia. 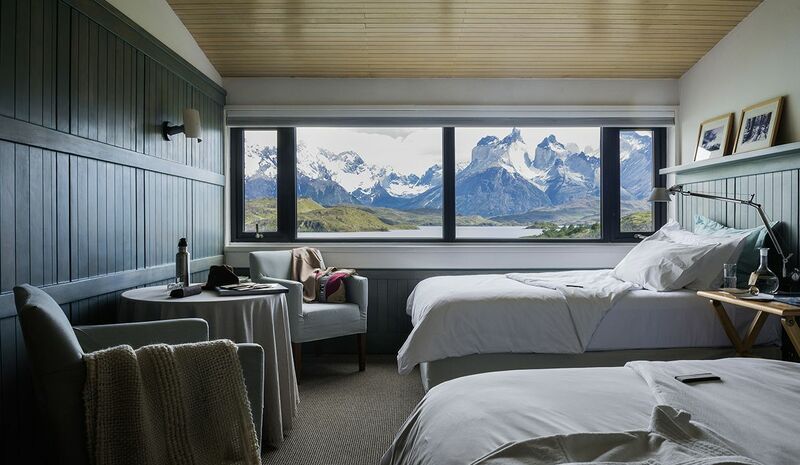 Each is 42 square metres with stunning views of Macizo del Paine. Enjoy in your suite a sitting area, a desk, beautiful bathroom with luzury ammenities and a king size bed. 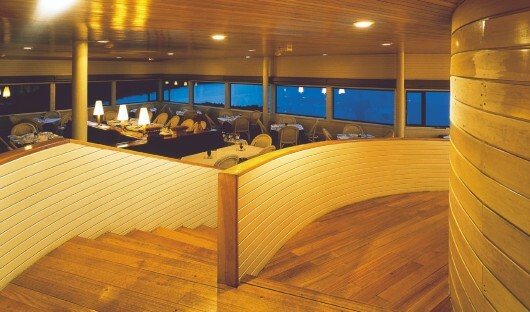 There are seven Salto Chico rooms at explora Patagonia. Each is 28 square metres with views of the Salto Chico waterfall. The rooms have king or twin bed configuration and a sitting area. The bathroom has a bath and shower as well as luxurious toiletries. 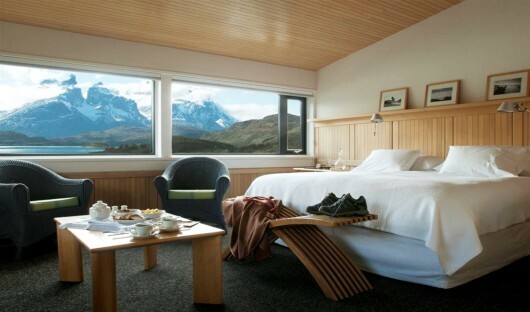 There are 36 Cordillera Paine rooms at explora Patagonia each measuring 28 square metres with views of the Macizo del Paine. The beds are king or twin configuration and there is a sitting area as well as a bathroom with shower and bath. Enjoy luxurious toiletries. Leaving the hotel by foot, you will walk along the Pehoé Lake, observing the various orchids and ñirre trees that comprise the local flora. You will gradually ascend to a triangular rock from where you will be able to see the intense blue of Lake Pehoé and the Paine ridge. If the day is clear you’ll be able to enjoy a unique view from above, quite different from that of the hotel. On your descent you will be able to observe the turquoise tones of the Paine River from afar. You will leave the hotel by van and go over the Weber Bridge, from where you will walk toward the Del Toro Lake and the park administration. Along the way you will see the abundant low-growing flora and rock, which prove that the park was completely covered in ice a million years ago. Once you reach the lookout, you’ll see the Del Toro Lake, the Serrano plains and the old gaucho ranches. During the descent, observe a small lagoon fed by rain water where birds, and, if you are lucky, black-necked swans can be seen. You will return to the hotel by van. Leave the hotel by van and head towards the area of the Pudeto station. From there you will walk along a path where you will see the largest formation of the massif, called Paine Grande, with its hanging glaciers. Later arrive at the turquoise waters of Lake Nordenskjöld. You can often hear the sound of breaking ice and the creaking noises of the mountains. Later, from the Nordenskjöld lookout, you will have a full view of the lake and the Paine Massif. When you are finished the hike you will return to the hotel by van. You will leave the hotel by van and head towards the Grey Lake station. Begin the excursion by crossing the hanging bridge over the torrential Pingo River and cross a lenga forest until you reach the shores of Lake Grey, generally quite windy, where you will be able to see the enormous icebergs that break off the Grey Glacier. After a moderate ascent, you will be able to see the Grey Glacier up close. Finally you will return to the Grey station where a van will be waiting to take you back to the hotel. You will leave the hotel by van and head towards the Serrano station. From there, begin the hike across the pampa Serrano, fully grasping the contrast between the flat grasslands and the granite Paine Massif. The Serrano River’s lush wildlife leads your hike. Upon finishing, meet the explora van that will take you back to the hotel. 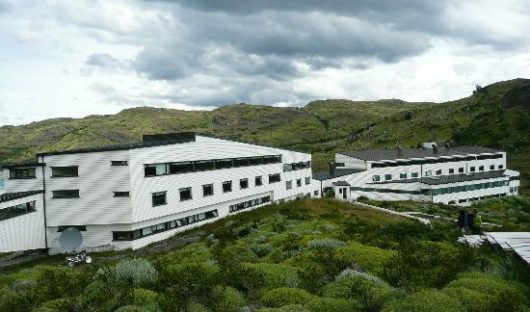 From the hotel you will begin the hike to the banks of the Paine River where you will follow a path with slight slopes, low bushes and small patches of forests, with outstanding views of the Paine River and the massif. This exploration begins at the explora Quincho, from where you will take the van to the Blue Lagoon and walk along a large wetland inhabited by numerous aquatic bird species. You will then walk along the beach of the lagoon with its transparent waters, and the Paine Towers will gradually come into view. Eventually you will reach a lookout from where you’ll see one of the best views of the lagoon and granite towers behind it. At this point, a van will be waiting to take you back to the hotel. After walking along the beaches of the Blue Lagoon, slowly ascend on a path lined with lenga and ñirre trees. Hike across plains until you arrive at a lookout with panoramic views of the Blue Lagoon and the Paine Towers. Return on the same path towards the van, which will be waiting to take you back to the hotel. Leave the hotel by foot, walking along Lake Pehoé and the camping area. From afar you will be able to see a mushroom shaped hill, at the top of which, the Mirador Cóndor which will be your destination. Along the way pass through lenga and ñirre forests whilst gaining altitude, feeling the force of the wind that makes this expedition all the more challenging. Once you reach the Mirador Cóndor, you will have a 360° view of the park, observing, among other things, Lake Pehoé, the Paine Massif, Lake Sarmiento and explora Patagonia. On the way back go down a steep rocky slope until reaching the van that will take you back to explora. A van will take you from the hotel to the beginning of the walk, along a trail of low vegetation where you will find paramelas, a natural indigenous flower known for its vibrant yellow color and pleasant scent. You will then descend to the beach of Lake Sarmiento Chico, crossing rocky formations of calcium, and ascend to panoramic views of Lake Sarmiento. You will return to explora by van. Leave the hotel by van and head to the eastern part of the park. This excursion is an excellent opportunity to enjoy the local wildlife, especially during spring, when animals are active and the vegetation is in full bloom. You will also visit a cave with 4,000 year old paintings and see geese, ducks and swans in the lagoons along the way. The terrain has various ups and downs without too steep of a slope. You will return to the hotel by van. Leave the hotel by van and head towards the Grey Lake station. From there, you will walk on a path along the Pingo River, crossing open fields and entering a dense forest of native trees. Along the way, enjoy different views of the Paine Massif along with its unique fauna, which includes ducks and parrots. Return along the same path to the station and take a van back to explora. Begin this expedition at the explora Quincho, from where you will walk towards the Paine Towers. This exploration allows participants to observe the park’s rich wildlife. You will cross native forests and finish with a descent during which you will be exposed to the strong Patagonian winds. Return to the hotel by van. Leave the hotel by van, reaching the Weber Bridge where you will cross the turquoise waters of the Paine River. There, immediately begin your steep, rocky ascent of the mountains bordering the river. The vegetation is low, allowing beautiful views of the Del Toro Lake, Paine River and Serrano Pampa where you can often see gauchos. After arriving at the highest point, you will descend along the same path. The wind and slope allow you to completely connect with the nature of the place. After you have finished arrive at the park administration where a van will be waiting to take you back to the hotel. Begin this exploration by crossing the turquoise waters of Lake Pehoé on board the explora catamaran towards the Paine Grande hotel. From here, walk towards the Grey Refuge along the border of the massif. Halfway up the ascent, you will be able to observe the Grey Glacier and the extraordinary extension of the Southern Ice Fields from above. Later, you will go down a steep path to the Lake Grey beach, from where a boat will take you closer to the towering walls of the glacier, navigating through the icebergs that float throughout the lake. This exploration is particularly interesting for geology and glaciology enthusiasts. To finish, cross a forest and the Pingo River hanging bridge to meet the van that will take you back to the loge. *This excursion is subject to climate conditions, as the boat rides may be cancelled due to strong winds. Cross the turquoise waters of Lake Pehoé on board of the explora catamaran and head towards the Paine Grande hotel, where you will begin the hike. Enter the French Valley surrounded by dense forest and native bushes, cross the hanging bridge over the French River, to reach the Italian camp. From within the valley, you will be able to observe the Glacier del Francés and the amphitheater of granite peaks that frame the area. On the way back return along the same path to the hotel. Leave the hotel by van and head toward the Cerro Paine Ranch, from where you’ll begin the hike around the base of Almirante Nieto, with its brush land and grasses. Later, you will hike along Lake Nordenskjöld, crossing forests and small ponds, and start a demanding ascent to the beginning of the Bader Valley, with breathtaking views of the horns, Lake Pehoé, Lake Sarmiento, Lake Nordenskjöld and the Southern Ice fields. You will return along the same path to the van that will take you back to the hotel. Leave the hotel by van and head to the Grey station, where you will immediately begin a very demanding ascent. Gradually you will be able to see Lake Grey and the enormous ice barrier of the Southern Ice Fields, until you enter a very dense forest. After crossing the forest reach the final point of the exploration, which is usually quite windy but rewards you with outstanding views of the Grey and Pehoé lakes. Return from the station to explora by van. Leave the hotel, on foot toward the Paine River until you arrive at the cliffs after which this exploration is named. As you gain altitude you will see the river and Lake Pehoé’s shades of turquoise, deep blue and green depending on the light. Once at the top you will be able to admire the Paine ridge and its surrounding valleys. This exploration allows you to see the park from different perspectives due to the many lookout spots. Leave the hotel by van to reach a steep path facing the Paine River, Lake Toro and the Serrano plain. Up in the mountains, the path goes into an old-growth forest, where the trees creak and the wind howls as if speaking to it’s visitors. Begin the ascent to a lookout exposed to the strong Patagonian winds, with unique views of the Paine Massif and its surrounding lakes. You will then begin your descent to where a van will be waiting to take you back to the hotel. Leave the hotel by van and head towards the Grey station, walking along side the Pingo River and crossing through a forest. You will then cross the Salmon River and emerge among mature forests full of clearings through which you can see parts of Paine Grande. Return along the same path to the Grey station where the van will be waiting to take you back to the hotel. Leave the hotel on foot, walking up a slight slope towards a lenga forest, where you will see the devastating effects of the last fire. Continuing your hike, arrive at a look out from where you will see La Cal Lagoon and probably be able to spot some condors flying above as they nest in this area. Later, descend to the lagoon where you will follow a path used by the Aonikenk and finish at the tranquil banks of Lake Sarmiento. Return to the hotel by van. The hike from the Valle del Francés to the Plateau involves reaching the Italian Camp and the lookout from where you will be rewarded with privileged views of the granite peaks, Lake Pehoé and the glacier. The hike is on a steep rocky path that runs along the moraine left by the glacier. On this exploration, follow the same path as the Grey Glacier exploration. From the Grey Glacier shelter, ascend towards the Park Ranger camp lookout, from where you will be able to truly grasp the glacier’s size. Later return along the same path to the shelter, from where you will board a boat that will take you up close to the glacier walls. As in the previous expedition, you will cross a lenga forest and the Pingo River hanging bridge to take a van back to the hotel. Leave the hotel by van and head towards the Cerro Paine ranch. From here, ascend towards the Ascencio River Valley and the Chilean Refugio Valley from where you’ll begin a steep ascent toward a lookout at the base of the Paine Towers. Once at the top, you will be able to grasp the magnitude of the granite towers after which the park is named. Drive out in a van to “Bahía El Bote”, located just outside the Park. Begin your hike in grazing fields, then start your ascent of Cerro Castillo (Castillo Hill) until you reach the summit. From there, you will have a 360° view of the Park and its surroundings. You will see hills, glaciers, pampas, lakes, and mountains. Descend through the forest back to the van. This excursion takes you deep into the French Valley ascending towards the lookout located in the center of the granite peaks. From the Plateau you will ascend very steeply going in and out of lenga forests and gradually approaching the Paine Horns. Continue to gain altitude until practically arriving at the base of the horns. 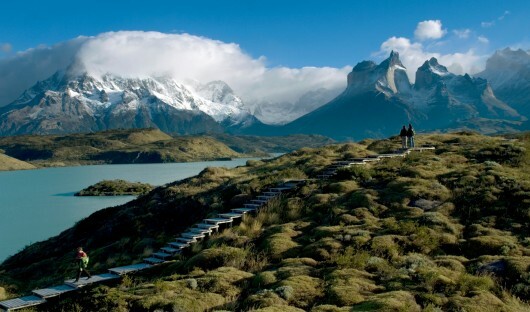 This exploration tours the eastern area of the Torres del Paine National Park, combining trips by van with brief hikes. The area mainly features wildlife such as guanacos, pumas and flamencos with vast shrublands and grasslands typical of the Patagonia steppe. First visit the viewpoint of the Nordenskjöld Lake and Paine Grande Falls; to then take a van to the Cisnes Lagoon to watch flamencos; and finally head to the Amarga Lagoon to enjoy a privileged view of the Paine Towers. Return to explora by van. Leave the stables and ride across rivers, forests and pampas as you ascend toward the Black Lagoon lookout. During the ride you will come across several lagoons, ideal for spotting bird species such as southern lapwings, and upland geese. Leave from the stables, riding across the Serrano Plain, crossing creeks and rivers with the Paine Massif behind you. Ride along the banks of the Serrano River and the Toro Lake, crossing parts of it. You will return over the plain, with a full view of the Paine Massif ahead of you. This ride is the hardest of the “beginners” explorations due to its climbs and descents. Leave from the stables and ride across an area of small hills, gaining altitude until you reach the Linda Lagoon, with panoramic views of the Paine Massif. Throughout this ride you will see small southern beech trees and birds such coots and southern lapwings. Begin riding over a plain from where you will be able to see the abundant flora and fauna. As you continue the ride, ascend up a hill of scattered beech lenga forest, gradually gaining altitude until you reach the Buena Vista lookout, from where you will see the mouth of the Paine River, with its vibrant shades of turquoise and the Massif behind it. Return to the stables on a steep but steady path. Begin this horse ride at the stables through a partially flat and open area until you arrive at a lenga and ñirre forest. Ride through the forest on narrow paths and climb a hill with moderate slopes, but completely exposed to the strong Patagonian winds. Once you reach the highest point you will be able to see Lake Toro and the Paine River. After this stop begin to descend on a steeper path to return to the same forest and then to the stables. Ride from the Quincho toward a large beech forest spread over several hills. Upon leaving the forest you will have panoramic views of the waterfall below, and the Las Chinas River flowing. Continue riding along a more open path until you return to the explora Quincho. Begin the ride from the explora stables and head towards the Grey River. The path is mostly flat and windy as it is quite exposed. Arrive at the banks of the Grey River, enjoy a ride along it, and return along the plain toward the stables. Leave the explora stables and ride across the Serrano plain until you come to a path that leads to the Grey River. 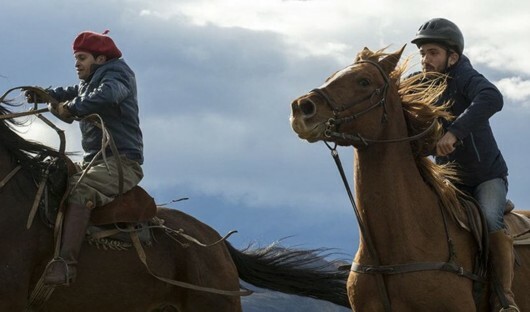 This horse ride has some elevation changes and depending on your expertise you can gallop over the plain and feel the intense wind behind you. Leave the Quincho and ride across the Las Chinas River, toward the valley of the Mercado ranch. You will be able to gallop and trot because this excursion is flatter than others. On your way back to the Quincho you will cross Las Chinas River, which can be quite deep and strong.This ride is not recommended for travelers who are afraid of heights. Leave from the stables and ride across the plain and along the Serrano River. As the ride continues, you will cross some roads and ascend to a lookout from where you will be able to see a small town on the outskirts of the Park and the vastness of the plain around us. On the way back, cross a small antartic forest before returning to the explora stables. Leave from the explora Quincho, and ride up a steep slope toward the banks of the Dry Lagoon, which looks similar to a salt flat. Later you will come to a lookout, from where you will be able to see the 2 de Enero Ranch, where the gauchos will welcome and treat you to a warm mate (local infusion) by an open fire. Return through forests and unstable terrains toward the explora Quincho. From the explora Quincho, ride across the Las Chinas River and begin a strong ascent toward the feet of the Sierra Jara. Ride across the ridge on unstable terrain and arrive at Santa Gemita. From there you will have clear views of the Blue lagoon and the Paine Towers behind it if the skies are clear enough. To finish, ride down a steep slope and return to the explora Quincho. This ride is not recommended for travelers who are afraid of heights. Leave from the stables and ride across the Serrano plain, crossing the Grey Bridge, and ride along the riverbank. From here, ascend upon a hill with dense vegetation, going in and out of beech forests. You will see wetlands and swampy terrain until you reach the Donosito lookout, from where you will be able to see the Serrano River, the Grey River, the plain and the Paine Massif behind you. Ride from the stables over the Serrano Plain and cross the Grey River. Ascend a densely vegetated hill, crossing creeks, lagoons and plains. Depending on your expertise, you’ll be able to canter and trot. Continue riding across wetlands until you arrive at the Donosito Lookout, from where you will see the Serrano River, the Grey River, the plain and the Paine Massif behind. Go up a narrow, pronounced path, crossing beech forests until reaching the Los Choros Lagoon where you will be able to canter along the shore. After lunch in a nearby forest, continue your ride back to the stables. Leave the stables and ride across the Weber Bridge, immediately ascending over sand and loose rock, until you reach panoramic views of the Toro Lake, the Serrano plain and the Grey and Serrano Rivers. After the ascent you will find a beech forest on rocky and relatively flat terrain to later go on towards the Sierra del Toro. 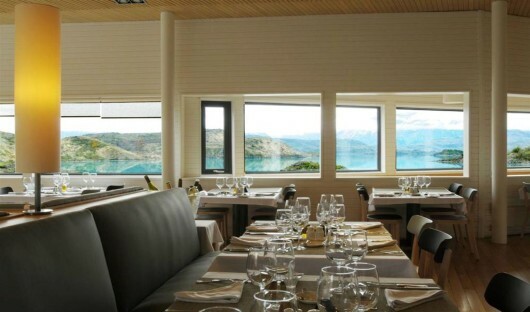 After crossing the beech forest, you will make a steep descent, and stop for lunch. Return along the ridge toward the stables along unstable terrain, often having to dismount in order to continue safely. Leaving the stables, gallop over plains and rocky terrain until you reach the Grey riverbanks, continue along until you reach a hill. You will ascend abruptly toward the Témpanos lookout from where you’ll be able to see the Grey Lake, it’s ice fields and glacier in the distance. For more information on explora Patagonia and to start creating your tailor-made itinerary, call 1300 784 794 or email contact@satc.com.au.